In the early 1900’s, Madeline Huling and her husband of Kankakee, Illinois, adopted a child from an orphanage in Rantoul, Illinois. They named the little girl Annabelle. She died at an early age. Madeline Huling later passed away in 1914 and left $50,000.00 to purchase land and build a home for children. 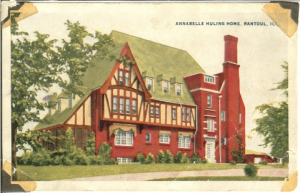 She stipulated that the building only be used for children, and for the name Annabelle to be used in some form as a memorial to her daughter. The money was overseen by the Illinois Children’s Home and Aid Society. 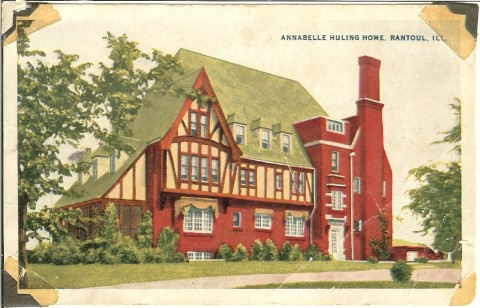 The Huling Home for Children was dedicated on June 18, 1924 and was open until 1975. Later it was reopened as a residential home for young boys and girls. The home later closed, and sat empty, until becoming a detention home for teenage girls which only remained open for a short time. Several years later, Beacon Therapeutic came and spent $30,000.00 in renovations to open a residential treatment home for boys and girls. They lost their funding and never opened. During the early 1980’s, Sandra “Sam” Burdette operated a home child care center. When the demand for local childcare came increasingly great, she discussed with her husband the option of opening a child care center. They searched for several months for a suitable building and were not successful. Finally, someone mentioned “The Huling Home” and they decided to look into it. What a wonderful building it was! Sam and her husband Don traveled to Kankakee, Illinois and met with a judge at the circuit court to get permission to use the building as a child care center. After they had permission, work on the building began. It was in very bad condition due to vandalism, and the fact that the heat had been off for several years. The walls were lying on the floor! With the help of the Champaign County Department of Corrections Work Release Program, Sam and Don were able to renovate the building for children and The Huling Home re-opened once again on March 18, 1985 as Anabel Huling Early Learning Center! The center initially opened with only 7 children and 2 staff members who taught, cooked and cleaned. Now Anabel Huling Early Learning Center has two sites and serves 108 children ages 6 weeks to 12 years. I lived in this home for a few years. My sister and I were under the care of Melvin and Pauline Hess. If you have any information you can share of any other kids (now 50-60 year old adults) I would love to communicate with them. We have a guest book which folks who used to live here sign when they come to visit. You are more than welcome to stop by anytime to take a peek and see if there is someone you know! We are unable to divulge personal information online. Thanks for your inquiry! I grew up there from 70- 76…? when Melvin and Polly Hess ran the childrens home, and when Champaign county took over, It went downhill then…. My mother and I lived there for five years. She cooked for our room and board and a little pay . This was approximately 1947 or 1948. I have many memories there. All good. I was spoiled by me being the youngest at that time. We have a “Guest Book” which visitors have signed with their contact information. Most of the visitors are folks who lived here as a child. Anyone is welcome to stop by and take a peek to see if there is any former friend whom you might be able to renew contact with! I was there between 67-71. What are the hours to come for a visit to be able to see the guest book. I would love to visit and see the changes. Thank you for honoring that the home stay for children. Connie? we should know each other? ?